Interview on video recorded at the European Development Days 2013, Saferworld Director of Programmes El Khidir Daloum discusses ways to ensure that peace is included in the post-2015 agenda. The EU’s State Building Contracts. A quick shot for fragile states, but how effective in the end? A mapping study of eleven European countries and the European Commission, May 2013. Volker Hauck and Andrew Sherriff submitted this study to EEAS the AETS Consortium – Cardno. Anna Knoll submitted this factsheet to EEAS the AETS Consortium – Cardno. Andrew Sherriff submitted this factsheet to EEAS the AETS Consortium – Cardno. Camilla Rocca and Frauke de Weijer submitted this factsheet to EEAS the AETS Consortium – Cardno. Andrew Sherriff and Volker Hauck submitted this study to the European External Action Service by ECDPM through the AETS Consortium – Cardno. Frauke de Weijer wrote a short section in this book called “Personal reflections”. Damien Helly participated in this seminar. Frauke de Weijer attended this meeting. Anna Knoll and other ECDPM colleagues attended this event. Andrew Sherriff made a presentation at the workshop. Volker Hauck attended this high level international working conference. Andrew Sherriff attended this meeting. Camilla Rocca attended this meeting. Peace and Security in the Post-2015 Framework: What Role for Civil Society in Influencing and implementing? Volker Hauck moderated the session 'Dialogue on Peace and Security Challenges'. Camilla Rocca attended this seminar. Volker Hauck attended this exclusive two-day, high-level gathering, examining urgent issues and solutions concerning major conflict flashpoints across the globe. Camilla Rocca attended this meeting on behalf of ECDPM. Camilla Rocca attended this Observatoire de l'Afrique briefing. Volker Hauck sat on the panel of this live chat. Anna Knoll and Volker Hauck attended this consultation meeting. Camilla Rocca attended and was asked to comment on the first panel at this roundtable. Volker Hauck attended this meeting. Damien Helly attended this meeting and moderated the session on regional strategies in the Sahel entitled: La mise en oeuvre des stratégies intégrées pour le Sahel : perspectives et défis à relever. Greta Galeazzi attended this meeting. Anna Knoll attended this event. Frauke de Weijer participated in this meeting. Volker Hauck attended this event. Bruce Byiers attended this core group meeting. Volker Hauck and Camilla Rocca attended this meeting. Bruce Byiers chaired this meeting. Volker Hauck participated in this workshop. Anna Knoll was a panellist at this event. Frauke de Weijer attended this event. Andrew Sherriff spoke at this conference. Developing Capacity from Rio to Reality - Who’s taking the lead? Volker Hauck attended the 5th Delft Symposium on Water Sector Capacity Development. Damien Helly attended this event. Bruce Byiers attended this meeting via skype. 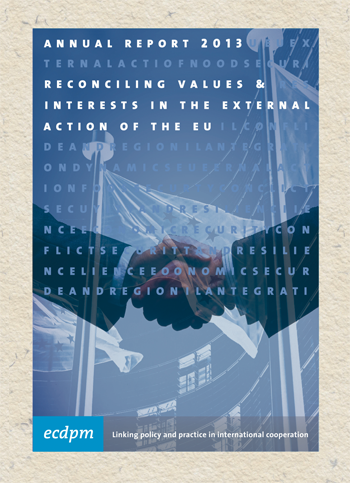 Conflict Prevention and the EU: What Role for the UK? Andrew Sherriff attended this event. Frauke de Weijer and Camilla Rocca attended this conference. Andrew Sherriff spoke at this event. 19 April 2013, Washington DCFrauke de Weijer has attended this event. Camilla Rocca attended this meeting as an observant for ECDPM. Frauke de Weijer attended this seminar that discussed the roles played by emerging powers in peace and security. Volker Hauck was a panel speaker during this event. Jeske van Seters and Camilla Rocca attended this conference. Camilla Rocca attended this first meeting as an observant for ECDPM. Frauke de Weijer presented at this meeting. Geert Laporte and Camilla Rocca attended this event.